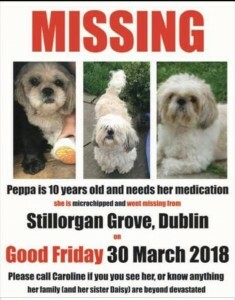 10 year old Peppa has been missing since Good Friday and urgently needs her medication. She was last seen in the Mount Merrion area near the church. Please phone Caroline at 087 918 8274 if you have any information.